The Poison Apples by Lily Archer. Grades 6-9. Alice, Reena, and Molly meet at an elite boarding school in Massachusetts. Though on the surface they don't seem to have anything in common, they eventually discover that they all have evil stepmothers. 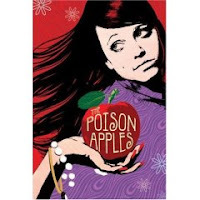 And when I say evil, I mean Evil with a capital E. The girls bond over their unfortunate family circumstances and form a club called the Poison Apples with the aim to get revenge on their stepmothers. Really, the revenge part (and even the Poison Apples part) is a very small part of the story. The evil stepmothers are used as a device to get the girls to the school and bring them together. It works. It's a bit unbelievable how evil the stepmothers are (and how totally clueless the fathers are), but each time one of the stepmoms did something heinous, I'd find myself actually yelling out loud at the book. So, y'know, I was pretty into it. The story is told through the alternating voices of each girl and one of the things I loved best about this novel is how Archer manages to give each girl a totally different voice. And these girls are very different. I liked each of them for different reasons and I was rooting for them to become friends. Boarding school girl cattiness, a dreamy English teacher, a bit of adolescent romance... and you've got a fun chick-lit book perfect for light reading over the winter break. The alternating viewpoints and friendships between such different girls really reminded me of Bass Ackwards and Belly Up by Elizabeth Craft and Sarah Fain. Another readalike might be The Sisterhood. Be sure and check out the review and interview with Lily Archer over at The YA YA YAs. Also, you might want to glance at the Bookslut in Training column Finding Your Way (November 2007) and another review at Krystel's Book Blog.